As I write this, we're packing up the Epson R2400 printers here in the workroom and getting ready to leave Nesbud for our return to Reykjavik. We're prepared for tonight's presentation at the Apple Store in Iceland's capital. We have a stack of amazing 13" x 19" prints that we worked on all day yesterday, in addition to a Lightroom-generated slideshow. You can get a glimpse at some of the images by visiting Adventure Gallery 3, which features the work of over a dozen of the photographers working here in Iceland. As you look at the work, keep in mind that the photographers used only the Develop module in Lightroom for their image editing. The only time people jumped over to Photoshop was when there was image sensor dust that had to be removed with the cloning tool. As of now, there isn't that function in Lightroom. Saturday morning we head back home. Life will return to normal here on The Digital Story. I appreciate your joining me in Iceland for this week's dventure. On Wednesday I was able to work with Maggie Hallahan, a commercial photographer based in San Francisco. She had made arrangements with Eskimo, an Iceland agency, to have five models come up to Nesbud for a shoot. Maggie had borrowed designer sweaters made here locally for the women to wear while we photographed them in the environment. One of the things I enjoyed about this shoot was having photographers on hand to hold reflectors and assist with the models. We shot existing light only, using reflectors for fill light or shading as necessary. Because of the long days here, we started shooting at 4pm and didn't put away our cameras until 11pm. I used the ExpoDisc to set my white balance in the changing light. That way I didn't have to worry about color correction in post processing, which is a big deal when working such long hours. The shoot went well, and I ended up with over 400 images. That's a lot of data when you're talking about 12 megapixel Raw files. I was hiking in the Nesbud countryside yesterday. The trails are much different than those in California. Here, it isn't so much a trail as it is a thin line of trampled grass with the occasional maker staked into the ground. As such, I often discovered that I had strayed, and would have to find a marker to get back on track. 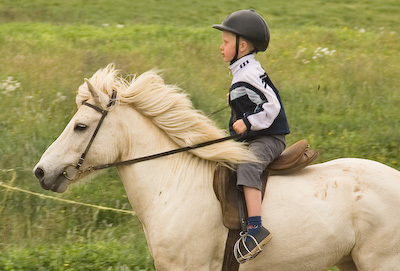 The Iceland sheep and horses are popular subjects. They have amazing hair that moves in the breeze, and the backdrop is almost always interesting. Since I'm the photo editor as well as photographer on this trip. I spend lots of time looking at images by my peers. Some amazing stuff for sure, and well beyond shots of the local livestock -- although some of the horse images are among the best I've seen. I've just posted the second Adventure Web Gallery with images by famous photographers such as John Isaac and Michael Reichmann. 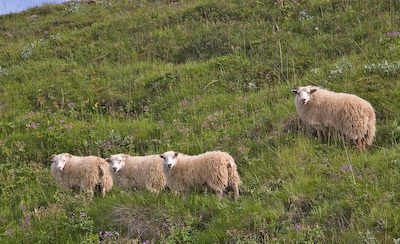 Sometimes, when we're traveling in small groups, I feel like the sheep I've posted here -- standing on the hillside, looking around, ready to dash off at a moment's notice. A sophisticated 10-megapixel DSLR with lens for under $900? That's what Sony is offering with their new Alpha D-100. This outfit should be especially appealing to folks who own Minolta SLR lens that will work nicely on this new body. In a recent review on DP Review, Phil Askey concluded that Sony has produced a real contender here. The picture quality is great. 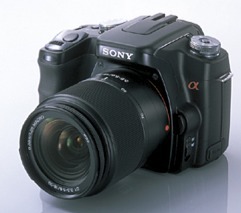 And the merging of Minolta and Sony creativity has yielded some innovative features such as Eye-Start AF and In-hardware Dynamic Range Optimization. The In-body SteadyShot system provides about 2 stops of additional shutter speed latitude with any lens you mount. The complaints were few. Noise levels are a little high at ISO 800 and 1600, and the proprietary hot-shoe design limits fewer third party flash options. But in the end, the Alpha A-100 earned a "Highly Rated" from DP Review. We found a tiny chapel outside of Reykholt Iceland while exploring on Sunday. Before the shooting commenced, we asked a local if it was OK to photograph the church. Not only did we get permission, but I found out there was going to be a wedding later that day. I was thrilled, since I wasn't able to participate in the wedding I had planned on attending the day before. We just couldn't work out the transportation. Now, out of nowhere, Iceland provided me with a second chance. I've published a few of those images, along with shots from eight other photographers on the team, at this Adventure Web Gallery. If you have a moment, I recommend that you take a look at the work of these great artists. Hopefully, we'll publish a second gallery very soon. Oh, and back to the wedding. The couple didn't have a photographer lined up. So, I'll be providing them with a few dozen images as a thank you for letting be part of their event. We left Reykjavik Saturday morning and headed north to Reykholt, where we would establish base operations for the next three days. Even though we had done some casual shooting in the city, I could tell the photographers were getting anxious to start working the Iceland landscape. To compound matters, the weather was quite good. So the process of getting organized, packing up, and finally hitting the road was agonizing. Once we got Reykholt, we had some soup (no one was serving meals in the mid afternoon), and the various factions of photographers scurried in different directions like startled baby quail. Our party shot until 8 pm, had a light dinner, then went out and shot the sunset 11 pm. It's 12:30 am now as I write this post. There's still light in the sky, but not enough for shooting. 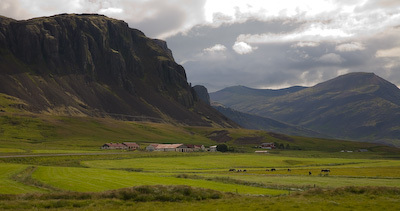 Today's shot was captured on the road to Reykholt. I used the Caonon 5D in Raw mode, ISO 100, 1/125th @ f-8, using the Canon 24-105 mm f-4 L zoom. I'm using a custom white balance setting with the help of an ExpoDisc, which I'll talk about more in another post. I'm using only Lightroom to upload, organize, and process these images. Tomorrow I'm going to catch a ferry out to the islands. If the weather holds, it should be another great day of shooting. 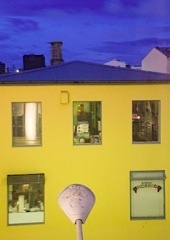 None of us have slept since Wednesday night, and it's about 1:30 am Saturday here in Reykjavik, Iceland. The sky is finally darkening. I took this image around 11:30 pm, and there was still plenty of light. We had a great gathering tonight, beginning with an amazing slideshow presentation by master photographer Sigurgeir Sigurjonsson, followed by a three-course meal at the SAS Radission 1919 Hotel. All of the photographers had a chance to talk shop, compare travel notes, and get to know a bit more about each other. In the morning we'll leave the city and head out to the country. But now it's time for a few hours sleep, for soon it will be light again. When I return, I'll have a very good idea of how well this version of Lightroom performs in the field under real shooting conditions. We'll be posting our shots, comments, and hopefully some video on the official Lightroom Adventure site. I'll also post more personal anecdotes, along with audio, here on The Digital Story. So stay tuned throughout the week for updates. If you have QuickTime on Mac or Windows, you can make a cool digital flipbook in just minutes. "What the heck is that?" you say. Well, it's a sequence of photographs played in rapid succession and saved as a QuickTime movie. You can see for yourself with the flipbook I created called The Bridge. 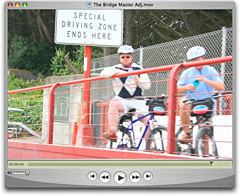 All I did was catch a ride across the Golden Gate Bridge with my Canon Digital Rebel XT pointed at the passing bicyclists. I had the camera set to burst mode so I could fire off a series of shots quickly. I took pictures from one end of the bridge to the other. I then uploaded the shots to a folder and launched QuickTime Pro. If you don't have the Pro version of QuickTime, it's $29 from Apple and available upon purchase. It has all sorts of nifty editing and presentation tools. The function we use for this project is called Image Sequence. Go to File > Open Image Sequence... and navigate to the first image in your folder of shots. Click Open, and you'll be presented with the Image Sequence Settings, as shown here. I usually select "2 frames per second" from the pop up window because I like things to move along at a good clip. But you can pick any setting that suits you. Click OK, and QuickTime will build your digital flipbook and open it in a 640 wide window. All you have to do now is add the audio. I usually grab a free loop out of GarageBand and make it as long as the flipbook I've just created. Once you've exported the file out of GarageBand (or whatever audio tool you use including QuickTime itself), the add it to your flipbook. Make sure the scrub head is positioned at the beginning of the movie, then go to Edit > Add to movie... You audio is now positioned as a sound track to accompany your flipbook. Go to File > Save As, give you completed work a name, and click the radio button "save as self-contained movie." You're finished! The version of The Bridge I posted here was exported as iPod compatible so I can include it with my other whacky projects on my iPod video. Give it a try... it's a really quite fun. Your Next Compact Camera - A Phone? Maybe your next point and shoot won't be just a camera, but a camera phone. Until recently, no self-respecting photographer would even consider using a camera phone instead of a dedicated digicam, but times are changing. I've been testing the Sony Ericsson W810i, that includes among other features, a 2-megapixel (1632x1224) digital camera with autofocus, f-2.8 lens, variable ISO, white balance adjustment, macro mode, assist light, self timer, burst mode, and panaroma mode. It also includes an amazingly good video capture (174Ã—144, 10fps, .3gp, 8KHz mono). QuickTime handles the files with ease. I can save all of this data to a Memory Stick PRO Duo memory card that comes in sizes up to 2 GBs. The W810i comes with a 512 MB Memory Stick. And the best part is, the card is easily accessible from a side slot. You can make photo quality 5x7 prints with this device, and up to 8x10s are possible. And they look good! Plus, it's a phone, Walkman MP3 player, and FM radio... all bundled up in a package that slides easily in your top shirt pocket. The SE W810i works great with Cingular's GSM/GPRS network. Cingular isn't offering it on their site yet, but you can buy unlocked W810i handsets on the open market, then put your Cingular phonecard in it. Going price for the W810i is around $380.